Outside Groups Are Already Spending Large Amounts On Races In Michigan’s 8th And 11th Congressional Districts. Who's Getting Involved? LANSING (OCT. 4, 2018) — Since Michigan lawmakers redrew congressional districts in 2011, the state hasn’t seen many close races for the U.S. House, and it hasn’t seen many extremely expensive ones either. But that latter detail seems destined to change in 2018. With a month still remaining before the November election, campaign finance disclosures already show that two of Michigan’s 2018 races for the U.S. House are on pace to be the most expensive the state has seen since the boundary lines were redrawn. The race in the 8th Congressional District, where incumbent Rep. Mike Bishop, a Republican from Rochester, is fighting for re-election, has already attracted about $9.2 million. There, Bishop’s general election challengers are Democrat Elissa Slotkin, of Holly, Libertarian Brian Ellison, of Madison Heights, and U.S. Taxpayers candidate David Lillis, of Lake Orion. The state's most expensive U.S. House race in 2016 attracted $9.4 million for the entire campaign. The 2018 race in the Oakland County-based 11th District, which included two crowded primary contests, has already drawn about $8.4 million. The general election features Republican Lena Epstein, of Troy, Democrat Haley Stevens, of Birmingham, Libertarian Leonard Schwartz, of Oak Park, and independent Cooper Nye, of Wolverine Lake. The money tracked in the races so far includes fundraising by the candidates' campaigns in the primary and independent spending reported as of Tuesday — more than a month before the election. Also, the candidate fundraising numbers cover only through July 18 — leaving 111 days of fundraising before the Nov. 6 election. Since Michigan’s congressional districts were redrawn in 2011, the state’s most expensive U.S. House races both happened in the Northern Michigan-based 1st District. In 2012, the race there cost about $10.6 million. In 2016, the race there cost about $9.4 million. Those totals include the fundraising hauls of all the candidates involved and the disclosed outside spending. The 2012 race in the 1st District was the closest general election race for the U.S. House in Michigan over the last three cycles. In that race, Republican Dan Benishek got 48.1 percent of the vote while Democrat Gary McDowell got 47.6 percent. That is the only general election race under the current district lines that’s finished within a margin of 5 percentage points. While there have been 42 general election races for full-term U.S. House seats in Michigan under the lines, only four have finished within a margin of 10-percentage points of the vote. Money often follows competition in political campaigns, and Michigan’s U.S. House races have been relatively less expensive than the most expensive races nationwide. According to the Center for Responsive Politics, which bases its numbers on candidate spending and outside spending, Michigan hasn’t been home to one of the 10 most expensive U.S. House races in the nation since 2010. U.S. House candidates will file new campaign finance disclosures on Oct. 15. Those disclosures will cover fundraising through Sept. 30. Of Michigan’s 14 general election races for the U.S. House, the outside spending has been most heavy in the 8th District, which includes Ingham County, Livingston County and parts of Oakland County. Twelve groups have already reported making independent expenditures either in favor of or against Bishop or Slotkin. 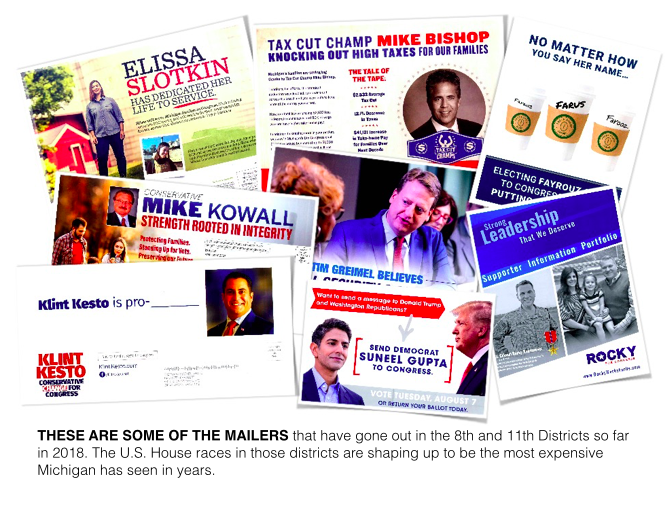 These groups can spend unlimited amounts in races on things such as mailers, TV ads and digital ads as long as they do it without coordinating with the candidates. According to disclosures, two of the biggest spenders have been the National Republican Congressional Committee, which has spent $1.3 million against Slotkin, and the Democratic Congressional Campaign Committee, which has spent about $608,465 against Bishop. America First Action, a super PAC, has also spent $703,731 against Slotkin. The PAC is “dedicated to electing federal candidates who support the agenda of the Trump-Pence administration,” according to its website. Another national PAC called End Citizens United has spent about $605,619 either in support of Slotkin or against Bishop. Slotkin’s campaign reported $3.0 million in total receipts for the election cycle as of July 18. Bishop’s campaign reported $2.1 million. The Oakland County-based 11th District saw two crowded and expensive primary races this summer. And now, it appears money will keep flowing to the district in the fall. Seven groups have reported making independent expenditures either to benefit Stevens, the Democratic nominee, or Epstein, the Republican nominee. The candidates hope to replace Rep. David Trott, a Republican who decided not to seek re-election. The biggest spender has been the Democratic Congressional Campaign Committee, which reported spending $730,394 either in support of Stevens or in opposition to Epstein. Another group called Women Vote!, a Super PAC connected to Emily’s List, has spent $576,828 against Epstein. As of July 18, Epstein’s campaign reported $1.6 million in total receipts. Of that total, $990,100 came in the forms of loans from Epstein herself, according to her most recent filing. Stevens’ campaign reported $1.0 million in total receipts. The state’s other U.S. House race that’s seen heavy outside spending so far is southwest Michigan’ 6th District, where Rep. Fred Upton, a Republican from St. Joseph, is running for re-election. When it comes to the candidates’ fundraising, Upton has a clear advantage. His campaign reported $2.2 million in total receipts as of July 18. Longjohn’s campaign reported $672,095.